Hello and Happy Tuesday! Time for another SIP Challenge! 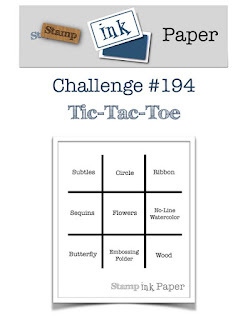 This time it's an awesome Tic-Tac-Toe with lots of fun options! I decided to go straight down the first row with Subtles, Sequins, and Butterfly! I was so happy to find out that Calypso Coral.. one of my favorite colors... was a Subtle in the Stampin' Up! Color Group!! You would think that since I am a SU Demonstrator, that I would have know that but I did not. I never keep anything sorted by SU Color Family! I always like to keep things in Rainbow Order. I used both the Concord & 9th Pretty Poppy Stamp Set for the flowers and sentiment and Stampin' Up Beauty Abounds Stamp Set for the butterfly. I stamped the flowers on the edge of a Whisper White panel with Memento Tuxedo Black Ink and used Calypso Coral Blends Alcohol Markers for my coloring. 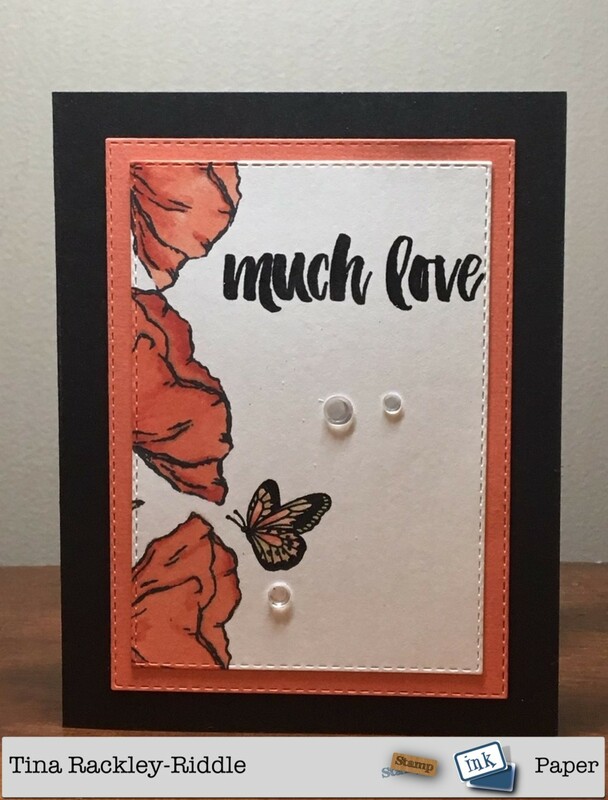 The butterfly was heat embossed in Black as was the "much love" sentiment. I used the fabulous Stampin' Up! Stitched Rectangle Dies for the front panel as well as the Calypso Coral matt. I love the way they pop on the Basic Black Cardstock.